The 23rd Arizona Cup will be held on March 22-25, 2012 as approved by World Archery Federation, (WA, formerly FITA) and World Archery Americas, (WAA, formerly COPARCO). The date is earlier than normal because of a very busy spring calendar and Easter. Links to various galleries of our photographers have been listed on a new "Photos" page. Thank you to all of our photographers! A satellite “unofficial” Mixed Team Competition was held in conjunction with the Arizona Cup for the Cadet recurve archers on Saturday afternoon, April 9. This event was created to make a second event for the many Cadet recurve archers who traveled great distances to compete in the FITA ranking round. Because of their shorter target distances the Cadets are not allowed to compete in the main Olympic Round or Open Team Events. Though the Mixed Team Competition did not count for ranking purposes, a great time was had by all participants, who gained valuable experience shooting in a team competition. 12 mixed teams were formed, most of which were self chosen while some were chosen to match participants of similar ability based on near-final FITA scores from the day before. Two teams were unisex teams due to the larger number of boys than girls. Teams that found themselves on the losing end after their first round match shot a practice match with another team; Alexis Drake and Jonathan Kuehn of Washington State shot a blistering 137 in one such match, which equaled the high score of the tournament. In the second round, Lanola Pritchard (Utah) and Dugan Denton (Montana), seeded 9th, tied the top seeded team of Elizabeth Caughell and Chason Hacking (Washington), and defeated the top seeds in a shootoff, 9 and 7 versus 8 and 8. Madison Eich (Washington) and Edson Kim (Brazil), the fourth seeded team, shot their way into the Gold Medal match first defeating Maianna Dematteis and Daniel Cunningham, then Pritchard-Denton in yet another shootoff. On the other half of the draw, third seeds Mackenzie Brown (Texas) and Christopher Luman (Georgia) paired to blaze their way into the Gold Medal match, defeating Cara Henslin (Georgia) and Nathan Yamaguchi (Arizona) in the semis. The Gold and Bronze medal matches were tight through the first three ends, with scores separated by a point or two at most. In the Gold Medal Match, Eich and Kim took a 1 point lead into the last end, but couldn’t hold on falling to Brown and Luman 137 to 134. Brown went home with another gold medal to add to her FITA gold medal from the day before, and Kim added a silver medal to his FITA bronze. For the Bronze, Pritchard and Denton finally won without a tie score and shootoff, victorious over Henslin and Yamaguchi 130 to 128. Great sportsmanship was shown by all the archers involved, and many new friendships cutting across team boundaries and geographical separations were sparked. This was the highlight of the tournament for many, and a success by any measure. Many thanks to judges Janet Yamaguchi and Sandra Reynolds, photographer Robyn Klimitchek, helper Rene Kuehn, and Director of Shooting Michael Cullumber for staying and putting on this event. Schedule page for easy reference has been added to the top banner links. Preliminary target assignments (subject to change) have been posted. Attention: USA Juniors and Cadets shooting in the Arizona Cup: Some of you have chosen to shoot up in age. Please read below to see if your current registration “Class” is what you really intended. You may check your current registration designation on the Entry List at http://www.arizonacup.com/2011/PrnAlphabetical.pdf (Note: “Age Cl.” Is your true age class based on your birthday and “Cl.” is the class that you have registered for. Example A: John is a Cadet age shooter, but has registered as a Junior and John shoots the Qualification Round as a Junior. · John is eligible for Qualification awards as a Junior, but not Cadet awards. Example B: John is a Cadet or Junior age shooter, but has registered as an Adult (Senior) and John shoots the Qualification round as an Adult (Senior). · John is eligible for Qualification awards only as an Adult, and not as a Junior or a Cadet. · John is not eligible for Junior or Cadet USAT Points. Please email admin@arizonacup.com, if you need to revise your age class designation. To assist the tournament in making target assignments and back numbers efficient, please make any class change requests by April 1. · Per the published information, the tournament requires membership in USA Archery (USAA, NAA) or the National Field Archery Association (NFAA). · Note: to receive National Ranking Points, USAT, Junior USAT, or Cadet USAT Points, you must be a USA Archery Member prior to the tournament. 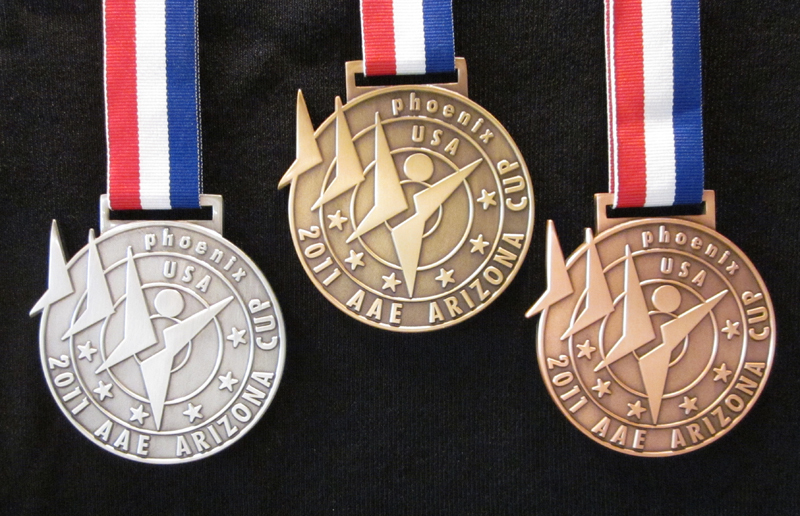 · Any archer who is a USA Archery Member will receive a ranking for the four National Teams. · For the athlete to be nominated to one of the four National Teams the athlete must be a U.S. Citizen. · Members of the NFAA may participate in the 2011 USA Archery Events without having to join USA Archery; however USAA Membership prior to the tournament is needed to gain ranking in the National Ranking System. · Please bring your USAA or NFAA membership card with you to the tournament. · Take advantage of the new online USA Archery Membership system to print out your card, renew your membership or join USA Archery. The Crowne Plaza still has rooms available at very attractive rates. You have choices as to what rates and services that you need. Please visit the "SERVICES" page and click on the Hotel link for more information and descriptions. Tournament entries have now reached the venue capacity. If you would like to be put on a waiting list, please email admin@arizonacup.com . If you are registered, but cannot attend, let us know so someone else can take your spot. Please check the Entries list to check for your name, spelling and your category. Unofficial Recurve Cadet Mixed Team Rounds are as close to official as they can get! Electronic scoring and award medals are planned. 18 RCM and 14 RCW archers are registered to date which can make for some great partnerships. Participation is optional and will not affect Cadet USAT ranking. Medals will be awarded to top three teams! Recurve Cadets, please email me, Gary Yamaguchi at gyflyfish@cox.net, and tell me if you would like to take part in the team round and if you would like the tournament to arrange a team partner for you. We need to know for planning purposes. On time registration is March 15, 2011. Late fee applies after March 15. Registration will stay open until venue is full. Are you registered? Check for your entry by going to the "ENTRIES" page and click on the "Registered Archers" List is updated often. Para Compound classified men and women may opt to compete in 2x72 at 70 meter rounds (144 arrows) in lieu of the compound 50 meter qualification rounds. 70 meter para compound archers are not eligible for the team rounds or individual elimination rounds. No awards for this option. Complete registration as a compound man or women. Include para category and “remain on the shooting line” information as applicable. When registration is posted online, email info@arizonacup.com with name and request 70 meter para compound rounds option. Request to take part in the para compound 70 meter round must be received no later than March 22, 2011. Once again, our tournament shirts are from Antigua. Shirts are in a new color called "Pacific". Unofficial Recurve Cadet mixed team fun round will take place on Saturday afternoon, April 9, 2011. All Recurve Cadet archers are welcome to enter as mixed (boy-girl) teams. Single archers are encouraged to take part and will be matched with partners to make up the maximum number of teams (both mixed and unisex as needed). Training on how to shoot a team round will be provided. For more information contact Gary Yamaguchi at gyflyfish@cox.net. Registration Packages for INDIVIDUALS and TEAMS have been posted. Please go to the Registration page for more information. The 2011 AAE Arizona Cup has been set for Thursday, April 7, 2011 though Sunday, April 10, 2011. At its annual Congress on 18 October 2010 COPARCO accepted to change name to "World Archery Americas". This is the first FITA Continental Association to take this step forward. Several teams have contacted the AZ Cup requesting preliminary pricing for fees and services so they can start their budgeting and funding requests. We have prepared a budget worksheet with the potential costs and choices. We hope to finalize the schedule, invitation package and the services by the end of November following the FITA November meeting. Until that time, we have the attached document which should allow teams to continue with their 2011 planning. At the recent COPARCO Congress meeting on Oct. 19 in Guadalajara, Mexico, the AAE Arizona Cup was nominated to be a 2011 world ranking event along with tournaments from Dominican Republic, Puerto Rico, Venezuela and Costa Rica. Mexico is the host for the 2011 Pan American Games. Please see the COPARCO 2011 schedule at www.coparco.org/Calendar/2009cal.htm for a listing of tournaments and dates. Thank you to the COPARCO leadership and membership for your continued support. World Anti-Doping Agency (WADA) has published the 2011 Prohibited List. These new requirements go into effect on Jan. 1, 2011. The link below will take you to WADA and links to a summary of changes, therapeutic exemptions and detailed information is available. Arizona Archery Enterprises, AAE, returns for its 5th year as the title sponsor of the Arizona Cup. AAE provides the resources for prize money and other improvements directly affecting the athletes. A preliminary letter of invitation has been posted. We welcome all archers shooting target archery including open archers as well as teams from FITA member organizations. The tentative dates are April 7- 10, 2011 depending on final schedule and format. The tournament is a USAT qualifier and has been submitted for World Ranking.